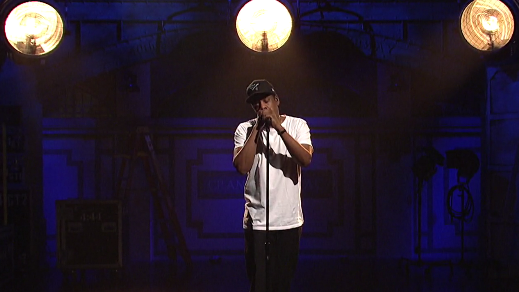 Watch Jay-Z Honor Colin Kaepernick On 'SNL' : The Record From showing solidarity with Colin Kaepernick to apologizing for his unfaithfulness at home, the rapper kept his Saturday Night appearance all the way live. Jay performed "Bam," the No I.D.-produced song from his recently released 4:44 LP that samples Sister Nancy's Jamaican dancehall classic. While Marley sang the climactic outro — "This a hunting season" — Jay turned his back to the camera to show the name "COLIN K" emblazoned across the top. Though Kaepernick remains a free agent without a team, the protests he started during the 2016 season to highlight the rampant number of unarmed black people being killed by police continues to drive national debate in his wake. When President Donald Trump suggested in a recent stump speech that team owners fire any "son of a b****" who protests during the national anthem, it inspired several teams and owners across the league last week to take a knee — though it was hard to distinguish acts of protest in support of Kaepernick's cause from acts of unity in defiance of Trump. Jay-Z's appearance on SNL highlights the most personal and politically-charged release of his career in 4:44. Following his standing protest, he returned later in the show to perform the album's title song, an apology to his wife and kids for his infidelity. In a stark departure from his charismatic persona, Jay stood on a naked stage, unadorned in a worn white tee, his gold chain tucked and eyes shut tight as he cradled the mic for support. While delivering the lyrics in a stream of emotional catharsis, he looked like a ghost haunted by his former shadow. In the end, the personal proved just as political for Jay.